Yup, fall is among us and with it brings a change in your skin care regimen. The leaves may be brown, the sky may be gray, but your complexion doesn’t have to be! For this to come to fruition you need to up your moisturizer game. What has been working for you all summer long probably wont cut it for the fall and winter months. Breaking up is always hard to do, but it’s time for you and your summer moisturizer to spend some time apart. It’s okay, embrace the change, you’ll see each other again next spring. Until then trust me, I’ve kept hydrated with the best of them and for me…nothing beats Amore Pacific Future Response Age Defense Cream. During the summer, many of us go with lotions that are slightly lighter in texture so as not to clog our pores when the heat and humidity are out of control. In winter, it’s time to transition to a cream. Future Response Age Defense Cream hydrates in addition to helping the skin’s cells regenerate themselves, but that’s not why I love it. This stuff goes on smooth and light, keeps my face moisturized all day long and nary a poor is clogged. So when it’s 15 below zero (as it is in Montreal sometimes) and your “epidermis” is showing, you won’t care because you know you’ll be well protected. 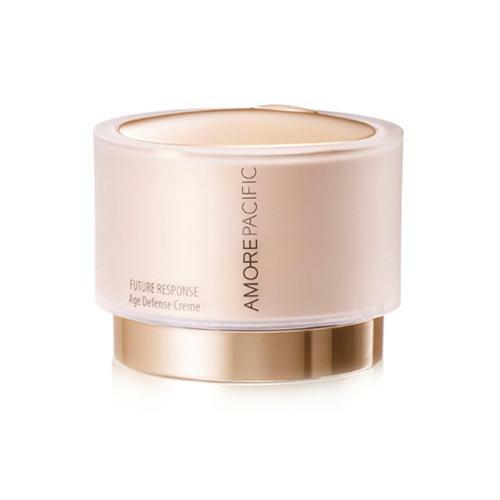 Amore Pacific Future Response Age Defense Cream is sold at Neiman Marcus stores, Bergdorf Goodman, Sephora and on the Amore Pacific website (it sells for $195 for 1.7 full oz.). I know it’s not chump change, but it will last you an entire season and then some. It’s my go to winter moisturizer and I hope you all like it.